Bullfinch collection Oiva Toikka Birds Wedding ... Color and joy tweeting around the house! The part of back and tail are white with gray shadows, neck and chest are in red. 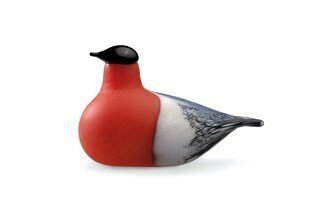 This bird has a wonderful combination of color, shape and pattern. The touch of color that was missing in your decor! Each piece is individually made in crystal. A colorful bird that looks great everywhere. Here, all the flavors matches with the interior decoration, and the nature is the main topic that complete and inspire the architect Susana Guimarães. We love the collection and all in particular! They are beautiful, very stylish and they have those colors that fit in any environment.